Located in an up and coming area of Buenos Aires called Puerto Madero, the brand new Faena Arts Center is a magnificent recycled wheat mill that now holds luxury apartments, offices, and a modern arts space. 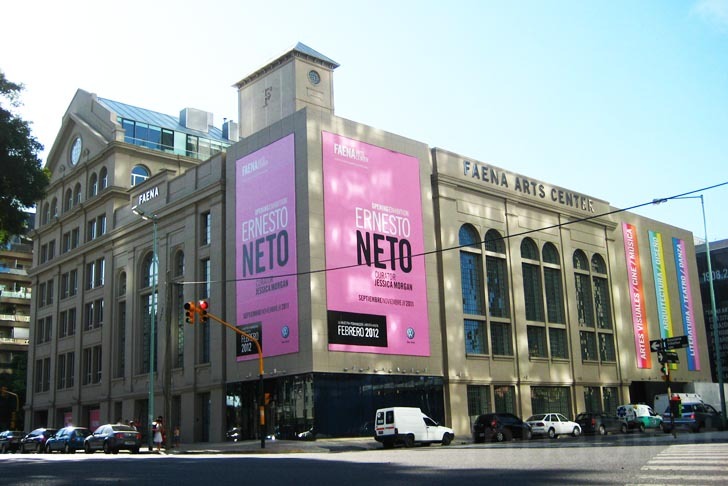 The building stands where an old 1908 Molinos Rio de la Plata structure used to be and is one of many developments financed by Argentine businessman Alan Faena. Designed by Faena Group Architects, who have previously worked in the area with Phillip Starck, Norman Foster, and Mike McCormack, the space was formerly used to produce food for Europeans immigrants running away from the first World War and now it keeps nurturing people with art and culture. The Faena Arts Center opened its doors at the end of last year and now boasts an immaculate marble staircase that takes visitors straight to the main room. A giant photograph of the old machinery room — which now holds the main arts space — contrasts with the newly renovated facade. The organic wooden information desk, made by the same artist who is showing inside, was built using no glue or screws and has matching benches scattered around the building. 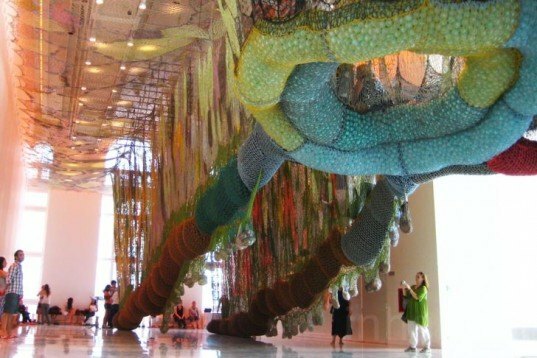 This fresh arts space is now showing a colorful and very fun piece by Brazilian artist Ernesto Neto. Curated by Tate Modern‘s own Jessica Morgan, this interactive structure hangs from the building’s high ceilings for everyone to enjoy. Made from standard hand-knitted climbing ropes, stones and plastic balls, the piece invites visitors to take their shoes off and wander around it. Like spiders on a web, kids and adults enjoy the large-scale structure, which is an example of Neo-Concrete art, a Brazilian 1950s movement that engages spectators by immersing them in giant three-dimensional spaces. Though it is masked by a modern renovated building that aims for luxury, the old recycled mill can still be seen through the large original windows and the whole shell structure from afar. A contrast between the old and the new, the basic and the luxurious, this magnificent new arts space is definitely an spot not to be missed in the bustling Argentine capital. The Faena Arts Center opened its doors at the end of last year and now boasts an immaculate marble staircase that takes visitors straight to the main room. A giant photograph of the old machinery room -- which now holds the main arts space -- contrast with the newly renovated facade. The organic wooden information desk was built using no glue or screws and has matching benches scattered around the building. This fresh arts space is now holding colorful, hanging and very fun piece by Brazilian artist Ernesto Neto. Curated by Tate Modern's own Jessica Morgan, this interactive structure hangs from the building's high ceilings for everyone to enjoy. Made from standard hand-knitted climbing ropes, stones and plastic balls, visitors are invited to take their shoes off and wander around the rainbow structure. Like spiders on a web, kids and adults enjoyed the large-scale structure, an example of Neo-Concrete Brazilian art from the 1950s. The old recycled mill underneath can mainly be seen through the large original windows and the whole shell structure, when looked from afar. A contrast between the old and a new, the basic and the luxurious, this magnificent new arts space is definitely an art spot not to be missed in the bustling Argentine capital.